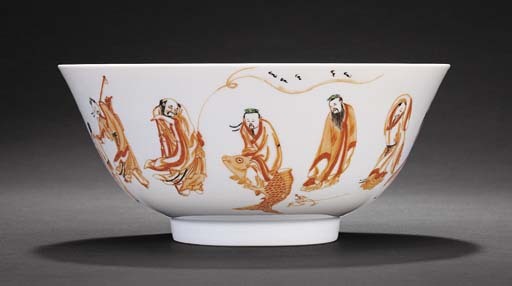 A near identical bowl is in the Qing Court collection, illustrated in Porcelains in Polychrome and Contrasting Colours, The Complete Collection of Treasures of the Palace Museum, Hong Kong, 1999, pl. 118; while another was included in the Oriental Ceramic Society exhibition Iron in the Fire, Ashmolean Museum, Oxford, 1988, illustrated in the Catalogue, no. 79.